Another year gone by in no time and still lots has happened. Lets start with Christmas 2016: I celebrated my first Christmas back home with my family in Germany since I migrated to Australia in 2002. Of course my visit was jam packed with spending time with family and friends, visiting Christmas markets, eating home made cookies, drinking hot Aperol, celebrating Christmas, walking in cold fresh air, just to name a few activities. All to soon I was back in Perth. Lucky it was summer – my favorite time of the year. During summer and early autumn I always spend lots of Saturday and Sunday mornings down at the beach. I love my morning routine of getting up, putting my bathers on and heading down to the beach for a dip in the ocean and a little bit of sun bathing. Once back home, I have a shower and breakfast. Nice way to start the day, isn’t it? Another “summer institution” is the weekly outdoor movie visits with my friends Albrecht and Ross. We always share a yummy picnic and of course a bottle of wine before the movie. Since I had a busy last couple of months at the end of last year, I was looking forward to a relaxing January. Beside the usual summer activities the only other adventure was a trip down south to Busselton together with my friend Claudia to visit my friends Peter and Bernie. It was a relaxing and enjoyable weekend, chatting, walking the jetty, enjoying a yummy dinner and having a swim in the ocean. In February my friend Karolina from Germany came for a visit and we did lots of little trips on the weekends and in the evenings when I came home from work. The highlights were Fremantle, Caversham Wildlife Park, Kings Park, Swan Valley and Penguin Island, which was new for me too. From March life turned back to normal I had time to catch up with my friends again. I visited Vada and Ben with their little girl Charlotte a number of times during the year and I can only say, that I am in love with this cheeky little girl! Most times she just smiles from ear to ear and is very happy. She also starts talking and seems to get cheekier every day. 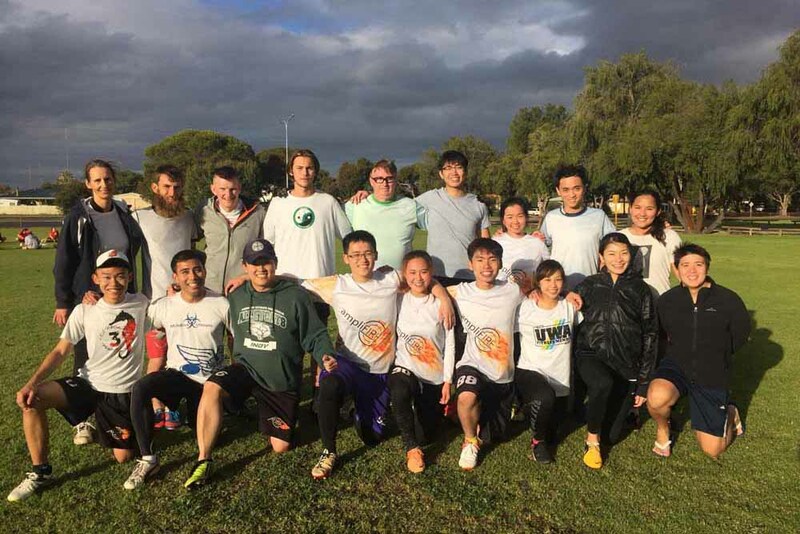 In May I played one day of the “Move in the Groove” Frisbee Tournament in Bunbury. It was great to catch up with other players and good fun playing; even so I was buggered afterwards. Lucky I only signed up for 1 day, so I could recover on Sunday. One of my highlights every year is the visit of the big Craft Fair, but it was rather disappointing. Each year there are fewer booths for scrapbooking and more for quilting and nobody had the products I was after. Unfortunately it has also become a very expensive event. After admissions, parking, a bit of food and a coffee I had spent $50 and at the end I didn’t get any of the products I had set my eyes on. I guess I won’t be going next year and rather spend the money by ordering online or going to my favorite craft store in Perth. In June I was dog-sitting Zoe for a couple of days. She is a lovely cuddly girl and we had some good times, but I also had to tell her off: While I was at work she must have been bored and so she started digging in my garden. I think I found something like 13 holes, basically wherever there was bare earth with no plants she dug a hole. I wasn’t impressed and told her off and she didn’t do it again! In July I was back on the plane to fly to Germany again, as my mum’s 80th birthday was coming up. The highlight was of course my mums 80th Birthday. The day started with a breakfast with family and ended with a party in the evening with family and friends in a restaurant. Next to a yummy dinner we had some entertainment from various people. My sister and hubby and my brother and wife had been busy composing a song for my mum and in the evening we kids with partners and all my sisters and brothers kids and one partner were performing the song in traditional Bavarian dresses. We just had to skip the shoes, as we didn’t have enough to fit everybody. Another highlight for my mum was her birthday present: we 3 kids invited her to a weekend in Bregenz with a visit to the outdoor lake stage to view the opera Carmen. We had a beautiful weekend away, just the 4 of us. We enjoyed good food, little walks around town, a trip with the cable car up onto the top of the “Pfänder” where we had an amazing view over the alps and lake Bodensee, a ship cruise on the lake and lots of coffees, Aperols, wines and of course the opera Carmen: A truly magical experience. We were also lucky that it didn’t rain, as this would have meant the end of the performance. We only had a bit of rain afterwards while we were enjoying a glass of red wine to celebrate this wonderful evening. After my return to Perth I was pretty quick back in the daily routine, but since I had brought back some stamps and dies that I had purchased in Europe I was keen on trying them and before I knew it I was in the middle of my Christmas card production. Unfortunately after the second week back at playing Frisbee I was in so much pain in my right hip, that I decided it was time to get it checked out. I had for quite a while every now and then a bit of pain, but it was usually not staying long and it wasn’t too bad, so I had always ignored it. But this time even after the pain eased it didn’t fully go away. So after the GP visit and an ultrasound I still didn’t know what was wrong and hence I had to see a hip specialist. As it is with specialists, you wait 6-8 weeks to get in and hence it was mid October until I saw the specialist, had a MRI and x-rays done and gone back to get the results. By then I thought I had worked out, that I had a labrum tear and was ready to have this fixed and get back to normal, but I didn’t count on the fact, that I also have a hip impingement, a bone cyst and worst of all osteoarthritis. This was quite a shock to the system and I felt like I am suddenly 20 years older. But once I got my head around it, spoke to various people, adjust my thoughts and my life, started physio and I got back on track and also much better. Very sad it meant also that I had to give up Frisbee and change to activities that have a low impact on my hip. So I am now doing short easy bike rides, hydro exercise, a bit of swimming and yoga. I guess in hind side I am glad I stopped playing Volleyball a couple of years ago; it might would have accelerated the damage if I would have kept going. The last couple of weeks have been busy with Christmas and holiday preparations, but I think I am getting there. I have less than 3 weeks to go before I fly out again! For another year I won’t be here in Perth for Christmas, but this time I am visiting my friends Jude and Jon in Tanzania, Africa for 2 weeks! Funny enough they were just staying with me last weekend for a quick visit to Perth. It was a great time with a break from my Christmas preps. After I have written all my Christmas cards all that’s left in December are wrapping Christmas presents, celebrating at multiple Christmas parties, a couple of outdoor movies with picnics and catching up with friends. I hope you have a wonderful and relaxing holiday season, a Merry Christmas and a fantastic, healthy and fun filled New Year 2018. Have a good flight to Tanzania… and see you soon! !